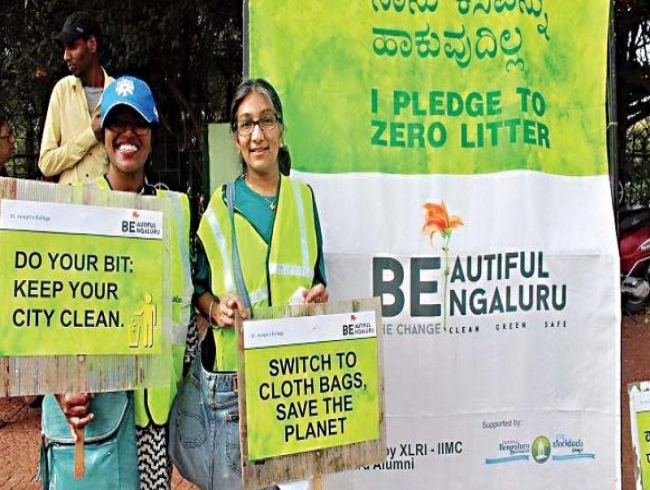 In a city where litter piles dot every street corner, Beautiful Bengaluru, an NGO the engages citizens to work towards a clean, green, safe city, has been trying to change the way people treat waste. Through its ‘Treasures from Trash’ contest, which completes its first anniversary this month, residents are being encouraged to create treasures out of trash. The monthly contest was launched last July and has since created much interest. Among the unique entries are a beautiful lampshade from eggshells pasted on a carton (Pranoti Kothari), growbag planters from flex banners (Sunil Achar), floating diyas from medicine wrapping (Bhavishya), broken crockery made into creative containers (Rakhi Mutreja), flowers from waste paper and straws (Gauri Nag Rajsekhar), even a Ganesha made of kitchen containers (Rupal Ralph)! Entries have been received from Bangalore, Hosur and as far away as Delhi, with participant ages varying from 4 to 64. The title of ‘Treasure champion of the year’ went to Priya Kala, a Bellandur resident, who has sent in many creative entries through the year. But the showstopper happened to be her creation from a broken jug that most would discard, but which she converted into an aesthetic lamp. Another noteworthy entry is from Amogh Trust, which is a group of individuals special people with special needs making many special products out of waste.